With production work by the legendary Kent Stump of Wo Fat, Careful What You Wish For, is the Lafayette, Louisiana-based quartet’s third official release overall after their 2011 EP debut “Crow Sessions” and its follow-up, their self-titled full length. 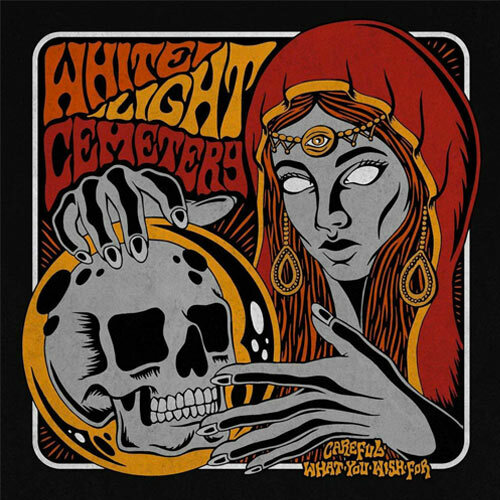 White Light Cemetery‘s guitarist/vocalist Shea Bearden, bassist Tara Miller, guitarist Ryan ‘Cletus‘ Robin, and drummer Thomas Colley are the very embodiment of metallic Southern Rock circa 2017 and this fact is verified all throughout “Careful What You Wish For“. If you’ve never heard WLC, it is what would result if one mixed the best elements of Black Oak Arkansas with Pepper Keenan era Corrosion Of Conformity and added a splash of Black Stone Cherry for flavor. Now, who the hell wouldn’t want to check that out I ask you?